This article is about the US rock band. For the UK rock band, see Battle (UK band). For the Korean band, see Battle (South Korean band). For other uses, see Battles (disambiguation). 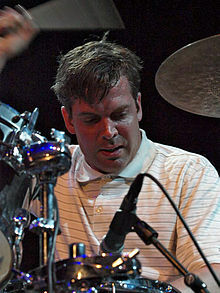 Battles is an American experimental rock group, founded in 2002 in New York City by Ian Williams (formerly of Don Caballero and Storm & Stress). The current line-up is guitarist/ keyboardist Ian Williams, guitarist/ bassist Dave Konopka (formerly of Lynx), and drummer John Stanier (formerly of Helmet). Former members include composer/vocalist Tyondai Braxton. The group is known for their catchy electric beats. They heavily utilize self-designed loops on Ableton Live. Following a string of EPs, the band released their debut album on the Warp Records label in February 2006, which was titled EP C / B EP. It is a compilation of their early releases, EP C, B EP and the single "Tras". Their first full-length album Mirrored, recorded by Keith Souza at Machines with Magnets, was released on May 14, 2007. The album received positive reviews and appeared on several top album lists for 2007. The first single from the album, "Atlas", was released on February 21, 2007 as streaming audio, and the accompanying streaming video was released on February 28, 2007. It was voted "Best Single of the Week" by NME magazine, and received a glowing review in the British Clash Magazine, as well as ranking at number one in the second Dandelion Radio Festive Fifty. The song was performed by the band on BBC television's Later With Jools Holland in November 2007. "Atlas" was featured in the Media Molecule' video game LittleBigPlanet, available for the PlayStation 3, and appears on the soundtrack for the second season of the Channel 4 program Skins. The track was also featured in Major League Baseball 2K8. The video for the track "Atlas" also appeared in a set of videos from Warp Films shown at the 2009 Clermont-Ferrand Short Film Festival, in Clermont-Ferrand, France. The audio track was featured on American Airlines in-flight radio programming and is used for Arto Saari's segment of Alien Workshop's skateboard video MindField. Battles released a streaming video for the track "Tonto", in which they collaborated with celebrated lights artists United Visual Artists. The accompanying single was released in late 2007. Battles scored their first UK cover feature in April 2007, talking to The Skinny magazine about the making of Mirrored. The song "Race : In" and a remix of "Atlas" were both used for car advertisements in the UK (for Audi and Honda respectively), and "Bad Trails" was featured in the film Big Fan. The introduction of the film All Tomorrow’s Parties, which was released in October 2009, features a live performance of "Atlas". This performance was recorded in May 2007 during the All Tomorrow's Parties festival that took place in Butlins Holiday Camp, Minehead, Somerset. A new song "Sweetie and Shag" was performed in Dublin on 10 December 2009. The songs "Leyendecker" and "Bad Trails" were both featured in episode 7 of season 4 of the UK teen show Skins. The song "The Line" is featured on the Twilight Saga: Eclipse OST soundtrack. 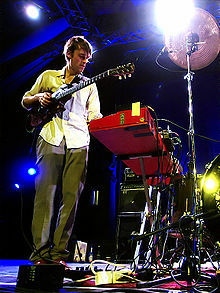 In August 2010, Battles announced that Tyondai Braxton left the band; Braxton had indicated that he did not want to go on tour, while Battles already had a touring schedule lined up for the upcoming year. Battles' second album, Gloss Drop, was released on June 6, 2011 featuring guests including Gary Numan, Kazu Makino, and Yamantaka Eye, and the band announced a spring tour in support of the record. In December 2011 the band curated the All Tomorrow's Parties "Nightmare Before Christmas" festival in Minehead, England alongside co-curators Les Savy Fav and Caribou. From February to April 2012, a series of four 12" vinyl EPs were released, titled Dross Glop (a spoonerism of the album's title) 1 through 4, featuring dance remixes of all the songs on Gloss Drop by various artists, including Gui Boratto, Kode9 and Hudson Mohawke. A compilation album featuring the 11 remixes (plus one not included, "Sundome") was released on April 16, 2012. In August 2012, multi-platform video game Sleeping Dogs was released by Square Enix in which it features the song "Futura" in the in-game radio station, Warp Radio. Warp Radio exclusively consists of Warp Records artists including Battles and Hudson Mohawke, who prior to the release of the game, remixed Battles' Gloss Dross track "Rolls Bayce". In September 2012, "Ice Cream" was featured in a commercial for the video game FIFA 12. The commercial includes actor and comedian Seth Meyers, Olympian and professional basketball player Steve Nash, and Olympian and professional goalkeeper Hope Solo. In 2014, Battles announced via their Facebook page that they were recording their third album. On July 15, 2015, the band announced that the new album would be titled La Di Da Di and was to be released on September 18, 2015. On August 4, the band released a live session through Warp Records of them performing four new songs in New York City, "Summer Simmer", "Tyne Wear", "Dot Com", and "The Yabba", the lattermost of which was given a music video on September 9. The stream was up for 24 hours only, and was set on a constant loop. They released another track titled "FF Bada" via soundcloud on September 2, 2015. 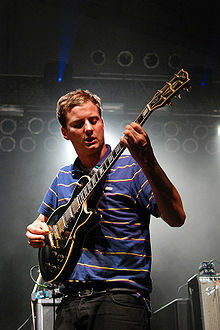 Dave Konopka of Battles performing at the 2008 Bonnaroo Music Festival in Manchester, TN. Ian Williams at the 2008 Moers Festival. John Stanier, 2008 Moers Festival. ^ "NME Reviews: Battles - Atlas". NME. 2007-04-11. Archived from the original on 5 June 2011. Retrieved 2011-05-18. ^ "An announcement from Battles". Warp. 2010-08-06. Retrieved 2011-05-18. ^ Cannon, Sean (2011-03-02). "Battles Announce Tour Dates in Support of New Album". Buzzgrinder. Archived from the original on 25 May 2011. Retrieved 2011-05-18. ^ "The Battles Variable". Exclaim!. June 2011. Retrieved 2011-06-01. ^ "Nightmare Before Christmas curated by Battles, Caribou, and Les Savy Fav" (Press release). All Tomorrow's Parties. 2011-02-28. Retrieved 2011-12-27. ^ Breihan, Tom. "Battles Soundtrack FIFA Soccer 2012". Stereogum. Retrieved 1 January 2013. ^ "Battles Announce New Album La Di Da Di". Pitchfork Media. Retrieved July 15, 2015. ^ "Battles 'NYC Live Session'". Exclaim!. Retrieved August 5, 2015. ^ "Battles Rock Out in Eerie "The Yabba" Video". Pitchfork Media. Retrieved September 9, 2015. ^ "Battles Share Second 'La Di Da Di' Single, 'FF Bada'". Spin. Retrieved September 4, 2015. ^ "Battles: Belgium Charts". Ultratop. Archived from the original on 2012-11-02. Retrieved 2011-09-27. ^ "Battles: UK Charts". The Official Charts Company. Archived from the original on 2012-09-06. Retrieved 2011-09-27. ^ "Battles: US Billboard 200 Chart". Billboard. Retrieved 2011-12-27. ^ "Battles: US Heatseekers Albums Chart". Billboard. Retrieved 2011-12-27. ^ "Battles: US Independent Albums Chart". Billboard. Retrieved 2011-12-27. ^ "BATTLES — DROSS GLOP". Bttls.com. Archived from the original on April 8, 2012. Retrieved February 28, 2012. ^ "Mini-documentary "The Art of Repetition" on Battles | Ableton". www.ableton.com. Retrieved 2017-02-19. This page was last edited on 24 March 2019, at 15:49 (UTC).